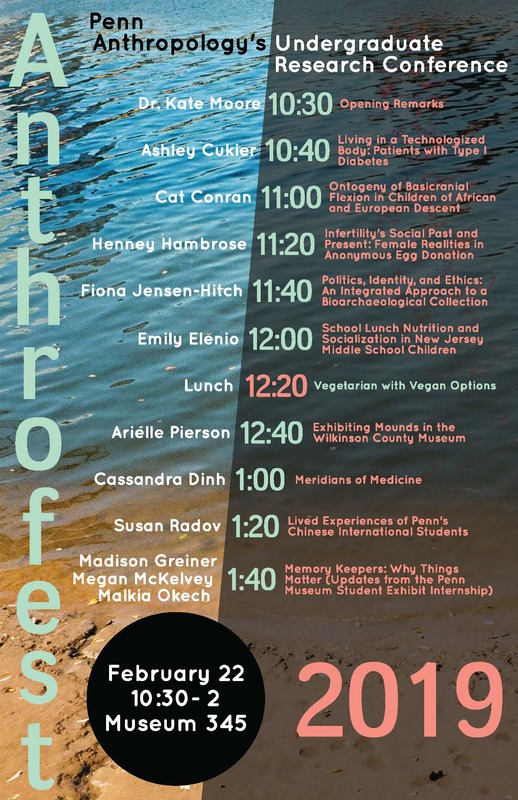 Join us for Anthrofest 2019! Anthrofest is the annual Penn Anthropology undergraduate research conference, which brings together undergraduates involved in research across all concentrations in anthropology, as well as faculty and the broader undergraduate and graduate student community. Each year the department sends out a call for proposals and selects advanced undergraduate students to present their original work. Attending the conference is an excellent way to show your support for our undergraduates and to see the fascinating anthropological research they have accomplished. Whether you drop in for one or two presentations, or stay for the whole event, we hope you can make it! Lunch will be served at 12:20 (vegetarian with vegan options).